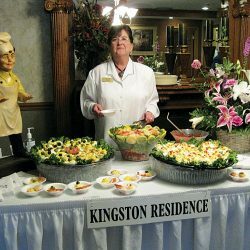 Every March the “Taste of Waynedale” fundraiser is held by Kingston Residence at their community located at 7515 Winchester Road. This fundraiser brings in local restaurants and businesses to offer samples of a variety of food or drink; perhaps a house specialty or seasonal and new items. Some vendors provide coupons and literature about their eatery. The event also boasts a silent auction, in which all of the items to bid on have been donated by local businesses. The intention of this fundraiser invites community members to enjoy all of the great food Waynedale has to offer. A Waynedale “win-win,” it raises money for community organizations, feeds guests and gives the area businesses an opportunity to showcase themselves to the public.